of the fine art of the medal. MASC is a non-profit organization with members located throughout the world. 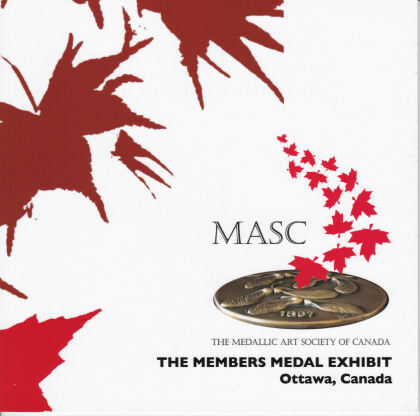 In accordance with the MASCs mission statement, the Society serves both the artists who create art medals and also those who appreciate and collect medallic art. The Society issued a newsletter three times a year for its membership called behind the MASC. We would be very pleased to receive your e-mail at info@medallicart.ca. Greetings from your friends at MASC! from May 23 to June 6. It was an outstanding event. The FIDEM XXXV International Congress was held in Ottawa May 31 to June 3. On the evening of June 1 there was an official opening of the exhibit for FIDEM registrants and MASC members. Included were special displays of the work of the late Del Newbigging, MASC's first President, FIDEM XXXV organizers Lynden Beesley and Susan Taylor as well as other MASC members. A few copies of the exhibition catalogue are still available. The catalogue is a wonderful souvenir of the exhibition and ideal for those not able to see it in person. For $22.00 you can order your postage paid catalogue right here using PayPal or e-mail info@medallicart.ca to make other payment arrangements. Select your payment below based on whether you are a Canadian or non-Canadian member of MASC. Canadian members will pay in Canadian funds and non-Canadian members in US funds. Should you need to supply any special information or instructions you may include a 200-character text message. When you click "Add to Cart" you will be taken to the PayPal web site where you will enter your e-mail address and PayPal password. 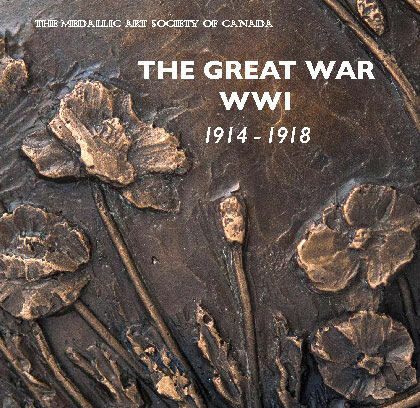 The Medallic Art Society of Canada and City of Toronto, Museum and Heritage Services hosted an exhibition of commemorative medals celebrating the 100th anniversary of World War I at the modern designed Fort York Visitors Centre, Toronto, Ontario. A print-on-demand catalogue of the exhibition is available. The catalogue is a wonderful souvenir of the exhibition or for those not able to see it in person. Click here to visit the web site of the catalogue's publisher. THE 150 CANADA - A Celebration Exhibition! Canada turns 150 years old in 2017. Two of Canada's foremost art societies united to hold a joint exhibition in recognition and celebration of this historic moment in time. 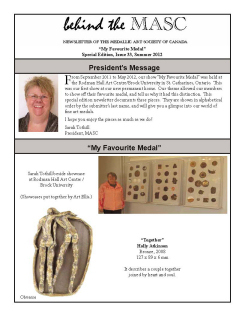 Members of the SSC (Sculptors Society of Canada) and MASC (Medallic Art Society of Canada) created new work in their distinctive and varied approaches in tribute of their nation's birthday. The exhibition may have closed, but a print-on-demand catalogue of the exhibition is still available. The catalogue is a wonderful souvenir of the exhibition especially for those who were not able to see it in person. 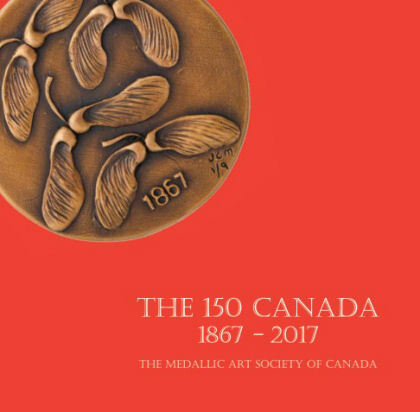 We are pleased to extend this invitation to join the Medallic Art Society of Canada. Here is a complimentary sample copy of our newsletter from early in 2015. Please Download and read our sample behind the MASC newsletter. Even though our free membership in 2015 has passed, we hope you find the articles to be of interest. Because of some special features in this issue you will need an up-to-date copy of the Acrobat Reader application on your computer or tablet to read it. 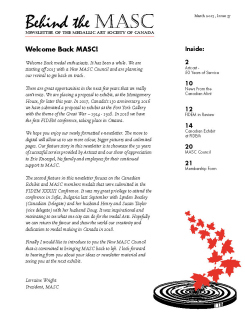 We hope you enjoy the newsletter and join MASC! was held at the Rodman Hall Art Centre/Brock University in St. Catharines, Ontario. This was our first show at our new permanent home. Our theme allowed our members to show off their favourite medal, and tell us why it had this distinction. This special edition of the behind the MASC newsletter documents these pieces. They are shown in alphabetical order by the submitters last name, and will give you a glimpse into our world of fine art medals. I hope you enjoy the pieces as much as we do!